It was a rough day for both the Bulldog and Lady Bulldog soccer teams. 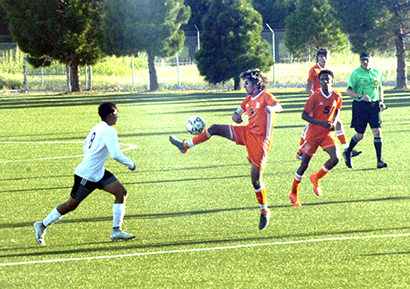 In contests that saw the two Artesia squads manage just a pair of shots on goal apiece, the boys and girls in orange also fell by identical scores – 6-0 – to the Class 5A Hobbs Eagles. Artesia could get nothing going offensively against the perennially strong Hobbs teams, which dominated the possession game and kept the heat on the Bulldogs’ and Lady Bulldogs’ defenses. In their 2018 home opener at the Mack Chase Athletic Complex, things went well overall for the ‘Dogs in the first half. The Artesia boys moved the ball into Eagle territory a few times but were unable to create a shot on goal; neither, however, were they giving Hobbs any open looks until the 21st minute, when an attempted slide kick by a Bulldog defender missed, leaving Hobbs forward Alan Sanchez wide open in front of the net. His shot from point-blank range gave the Eagles a 1-0 advantage at the break. “Going into the second half with the score just 1-0 against them was a great thing,” Artesia head coach Phillip Jowers said Tuesday. Unfortunately, the ‘Dogs were caught off guard early in the second 40 minutes, and things quickly snowballed from there. 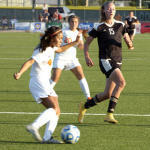 The Eagles notched their second goal just 42 seconds into the final half, and it appeared to somewhat deflate Artesia. A third goal came just under a minute later, followed by a fourth and fifth in the 13th and 14th minutes respectively. Hobbs capped off the final in the 26th minute with a header into the back of the net. Despite the lopsided score, senior keeper Aaron Natera saved and deflected a multitude of other attempts by the Eagles. Having competed annually with Hobbs for numerous seasons now, Jowers says his athletes know nothing less than their best effort is needed against the solid program and that he schedules teams of the Eagles’ caliber for a reason. The ‘Dogs will travel to Moriarty Saturday for a 3 p.m. bout with the Pintos. “Moriarty is a good team, too, so it should be a pretty good game,” Jowers said. Meanwhile on the road at Watson Memorial Stadium, the Lady Bulldogs were suffering their own offensive war of attrition against the Lady Eagles. Hobbs took a 3-0 lead out of the first half Tuesday, logging their first goal in the 15th minute, their second in the 23rd, and their third just moments before the break. A long shot in the 13th minute of the second half made it 5-0 Lady Eagles, and Hobbs rounded out the final with around nine minutes to go. All total, Hobbs took 18 shots on goal to Artesia’s two. The Lady ‘Dogs will host Class 5A Clovis at 6 p.m. Thursday in their 2018 home opener.